Fun and Sun Without the Buns: Let's Go Grocery Shopping! Okay. I don't know about ya'll, but going to the grocery store can be such a hassle sometimes. It's either packed, I go when I'm starving so I buy everything (and I let it go to waste), or I go when I'm full and don't even know what to get. Well, if you have any of these problems, then I hope I am about to make it a lot easier for you! I am going to break down a grocery list that I recommend for the best results. Of course, I don't get all of this stuff at the same time. I usually plan out what I want to eat for the week and go from there, but I am going to provide you with all of your basics that are the healthiest options. Remember, you do not have to get all of these, or you might even find healthy options to add to this list! I have mentioned this before, and I will mention it again... it's best to stay on the outside aisles of a grocery store! This is where you will find most of the non-processed foods. 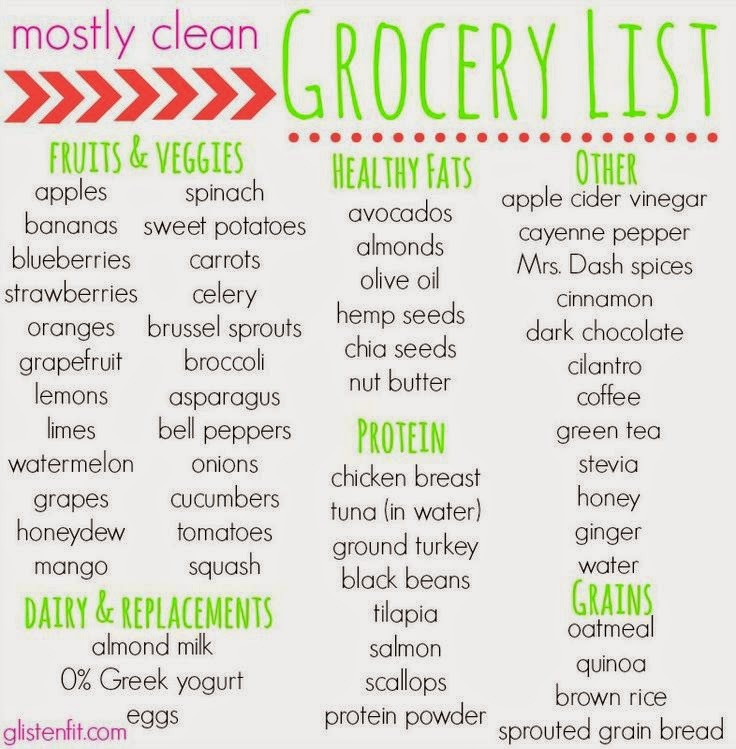 Also, I try and eat clean, so that is what I am basing most of my list off of. I typically go to the grocery store once a week. Usually on Sundays...when everything is sold out or picked over. Go figure. So whatever you buy, don't get too much. Get just enough to last you the week. Usually, the foods that I am listing only last about a week anyways because they are fresh. Honestly, you can get any fresh fruit you want! Fruit makes great snacks, desserts, and part of your breakfast. You can pretty much get any fresh vegetable you want too. I never limit myself on how many veggies and fruit I eat. Okay, I know that this is just a list and not so much what I make with these items, but that's what my new posts, "What's in My Lunchbox?" are for! I will be posting what I make and include how I make it! I will also be posting more recipes once my new layout is set up. Keep a lookout for dinner, breakfast, sides, and snack recipes along with my lunch recipes! If you have any grocery item recommendations, please shout it out! I absolutely want to hear your comments and input! Have a great Wednesday! I've got some awesome giveaways coming your way! And some news about what I will be doing fitness wise during the school year….I'm REALLY excited! I buy the steel cut oatmeal for breakfast which is gluten free and organic. I sweeten it with organic agave nectar and fresh fruit! I also use the nectar for my Greek yogurt! Amazing! So many people need something like this!